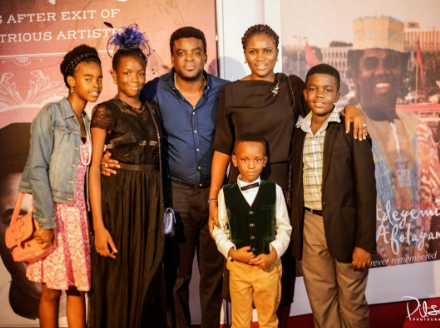 Popular Nigeria film maker Kunle Afolayan showed off his wife and children at a remembrance do held for his late father,the Nigeria and Yoruba film legend,Ade Love. Some younger ones might not quite know who Ade Love is,they probably just know the name as being that of the father of Kunle.But thanks to the Lagos state government and the activities of his son,that is about to change. as the copies they had in Nigeria had not survived the test of time. But he was quoted sums in the region of £30,000 plus for them. So he took a step back.But a fortunate meeting with the governor of Lagos state,led to discussions and they helped with the financing.Now thanks to this gesture,films such as the classic Adelove Taxi Driver will be made available for fans to see. The great man in one of his films. It is a befitting legacy for a man who gave so much to Nigeria theatre and film. I loved Mr Afolayan snr as a kid,his smile was infectious,and his talent overwhelming.Her wrote,produced,directed as well as sing and play an instrument or two.And the ladies loved him,well,with a name like that,they had no choice did they? His sons have since taken after him,currently along with Kunle,there are tow other brothers,Aremu and Gabriel continuing the legacy.